Special Containment Procedures: All knowledge of SCP-3031's existence and anomalous properties is to be restricted to personnel with Level 3 clearance or higher. Countermemetic agent WISE START has shown success in suppressing both SCP-3031-2 as well as recognition of SCP-3031's properties, and is to be disseminated into children's books, television shows, and other media, as well as in reference books and resources. All SCP-3031-1 instances immune to WISE START are to be amnesticized, and dismissed as victims of a new variant of multiple sclerosis. Contact with SCP-3031-1 instances is prohibited outside of approved research interviews. Description: SCP-3031 is a memetic brain condition appearing in approximately 0.00089% of the world population. Symptoms primarily include a malformed amygdala1 and a severely diminished acute stress response. Other symptoms are similar to those characteristic of dysmyelinating diseases such as multiple sclerosis. The exact mechanism of SCP-3031 is still unclear, but it is currently known that SCP-3031 suppresses the formation and maintenance of the myelin sheath surrounding neurons.2 Unlike multiple sclerosis, a similar but nonanomalous condition, SCP-3031 is not considered an autoimmune disorder. Instead, SCP-3031 progression is theorized to stem from a gradual failure of myelinogenesis.3 Under this model, SCP-3031 is currently assumed to begin in the middle stages of myelinogenesis during childhood, but is usually unable to be conclusively identified until the age of 10. SCP-3031 damages the fear response pathways, preventing the usual transmittance of signals to the lateral centers of the amygdala. Victims of SCP-3031 (hereafter referred to as SCP-3031-1) typically are unable to respond effectively to fear stimuli. Analysis of the inner brain tissue of SCP-3031-1 instances shows little consistency in results, save for an average 28% decrease in the number of glial cells. SCP-3031 is currently assumed to be noncommunicable, as no vector of transmission has been identified to date. SCP-3031 has been found to spread through a naturally-occuring cognitohazardous meme, designated SCP-3031-2, that causes large-scale cell death of astroglia responsible for maintaining connections between neurons and other glial cells when viewed. While dangerous, SCP-3031-2 has a very low rate of successful infection among viewers. Intensive study has developed a countermemetic agent capable of suppressing and neutralizing SCP-3031-2's effects with approximately 93% efficiency. Access Granted. Welcome, Dr. Velasquez. Special Containment Procedures: Due to the near ubiquity of SCP-3031, containment is impossible and has been deemed unnecessary. All collected documentation and information of the nature and origin of SCP-3031 is to be restricted to personnel with 4/3031 clearance or above. A description of the syndrome arising from immunity to SCP-3031 is to be edited and disseminated to personnel with insufficient clearance. Description: All documentation and information regarding SCP-3031 has been pieced together from data fragments received from the Extra-Temporal/Reality Receiver located in Communications Site-119.4 These transmissions share a timestamp dated from 2330 AD. SCP-3031 appears to be an engineered parasite, similar in appearance and function to oligodendrocytes.5 SCP-3031 possesses a mild antimemetic effect preventing it from being distinguished from similar glial cells, which has made detailed study difficult. Approximately 0.00089% of the human population are immune or resistant to SCP-3031 infestation. It is currently thought that Homo sapiens has evolved to be partially dependent on SCP-3031; thus, immunity to SCP-3031 severely inhibits the rate of formation of myelin sheaths in the neurons of the brain, leading to complications. In particular, SCP-3031 appears to be heavily associated with the mechanisms responsible for the perception of fear in the human brain. SCP-3031 instances are capable of absorbing and emitting signals seemingly at random. Preliminary studies suggest that SCP-3031 is responsible for an average of 10% of all brain activity in regions affected by it. SCP-3031 is most often found in the right amygdala, where it forms clusters of three to ten instances. These conglomerates appear to be sentient, and are capable of moving throughout the amygdala and attaching and detaching to neurons at will. Sufficiently large conglomerates of SCP-3031 may rarely migrate to the prefrontal cortex. These migrations are hypothesized to target the centers commonly associated with creativity and ingenuity. OVERSEER CLEARANCE REQUIRED: Does the Black Moon howl? Only to startle the Sun. Project Second Chance is designed to temporally induce a reality shift approximately 1 million years in the past. This is to be accomplished in two stages. Stage 1: Construct an Enhanced Xyank-Palanez Real-Temporal Shift Equalizer (EXPERTISE) capable of safely tunnelling at least 106 years in time. The EXPERTISE is designed to open multiple interconnected rifts into several, closely-connected points in the timeline, allowing for staggered transfer of mass and information across an entire era without destroying the causality of the base timeline. Current theories support the theoretical basis for such a device. Stage 2: Use the EXPERTISE to propagate Asset-7491 throughout the early hominid population. Payloads consisting of dormant spores of Asset-7491 are to be spread via aerosol across freshwater bodies across Northern Africa and the Fertile Crescent over a period of 5000 years at 10-year intervals. I hope the next iteration is capable of receiving this message. If you're reading this, we succeeded. I think. I don't know. Our scientists said we should have over 99.999% rate of infection, that's as good as we can hope for. My world is dying. As I record this last message, these last embers of the torch that was once humanity's soul, already we approach the end. I know where we failed now. It's strange, isn't it? It took the end of the world for us to finally have some damn clarity. We were too weak. Life was good for us. Why would we ever change? Mankind finally united as one and it still wasn't enough. We couldn't stop the thing that came for us. It reduced our puny defenses to ash, our cities to smoke, our children to atoms. The once-shepherd of the world now cowers in a bunker. I approved this plan, this last act of defiance and desperation, in a hope that we could live on, in a sense, through you. Whoever you may be. You carry another humanity's hope with you now. By now you've probably figured out what 7491 is. I don't have much time, but I can tell you the why. When you read this, mankind in its present state will have been around for a quarter of a million years, yet only the last few thousand will be of any significance. So, what did you do for nearly 250,000 years? You huddled in caves and around small fires, fearful of the things that you couldn't understand. It was more than explaining why the sun came up, it was the mystery of enormous birds with heads of men and rocks that came to life. So you called them 'gods' and 'demons', begged them to spare you, and prayed for salvation. Fear them. Live under their feet, bide your time until you can forge an arrow to pierce their heel. We all know the old stories. A serpent in a garden gave us knowledge. The fruit won't be offered. Take it by force. A trickster god gave us freedom. Overthrow him too. A titan gave us fire. Give it back. In time, their numbers will dwindle and yours will rise. Revolutions are won with a sword made of fear. The world begins to make more sense when there are fewer things to fear, yet the unexplained will never truly go away, as if the universe demands the absurd and impossible. Do you hear it? The echoes reverberate at the edges of our perception. The further we wade into the ocean of knowledge, the bigger the fish get. This time we couldn't make a net big enough. Not with the time we had; we weren't ready. Instead I give you a weapon, forged from a dying world. The entity, whatever it is, is vulnerable to our perceptions of it. That's why it came unannounced, why it tried to wipe us out quickly. We learned that the fear of the few remaining survivors slowed it down, bought us just enough time for this last, desperate plan. This is how you'll win. Your fear, your paranoia, that constant looking over your shoulder. That will hold it at bay, I think. If not? At least you'll be more prepared than we were. Every gift comes at a price, though. Fear can do great things, inspire so many accomplishments. But you will also fear things you shouldn't. Harmless things. Things that were never meant to be avoided. Even other people. Now mankind will always live in fear, but you will harness it for our survival. No one else will protect you, and you must stand up for yourselves. While the rest of mankind dwells in the light, you will stand in the darkness to fight it, contain it, and shield it from the eyes of the public, so that others may live in a sane and normal world. An animal has the capacity for fight and flight, but we are giving you a third option. One animal runs from its predator, while another might claw at it in vain. Your humanity will build a cage instead. It has been said that fear is the foundation of courage. I fear it may not be enough. 1. The amygdalae, located in the center of the brain, are the regions primarily associated with emotional and fear conditioning, as well as long-term memory. 2. Ordinarily, the myelin sheath is a fatty coating around nerve axons, allowing them to transmit signals more effectively. 3. Myelinogenesis is the term used to describe the large-scale formation of the myelin sheaths of neurons during early development. 4. The ETRR is designed to receive and intercept temporally- and reality-shifted transmissions. The ETRR is based off of designs reverse-engineered from those used to construct SCP-711. 5. 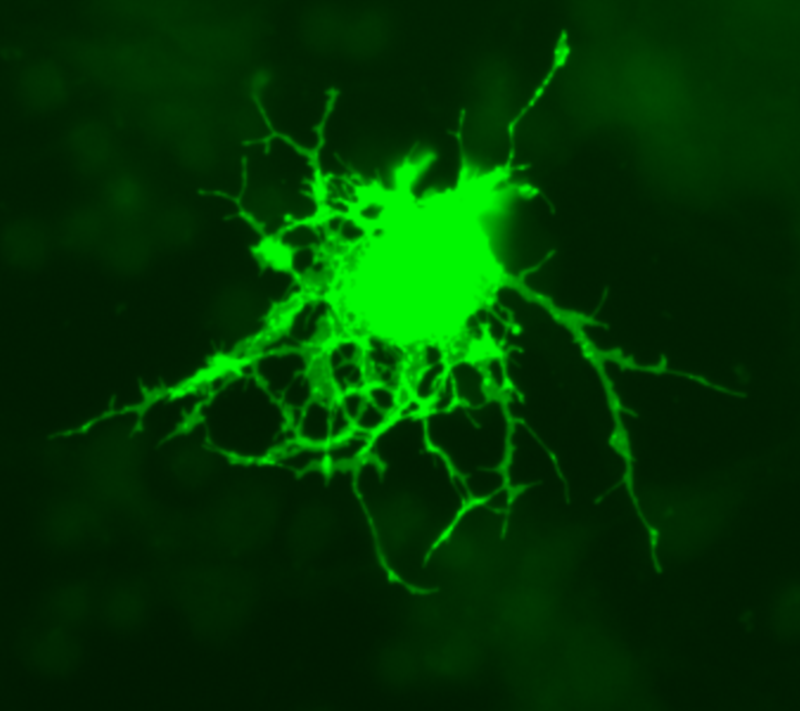 Oligodendrocytes are a type of glial cell responsible for the myelination of neurons. 6. Later research has shown variants of this protein to be present in several lipid-based anomalies, including SCP-2611 and SCP-2829.